Utilizing super bright high-powered black light CREE LED lamps, these stroboscopes are perfect for UV ink printing applications. 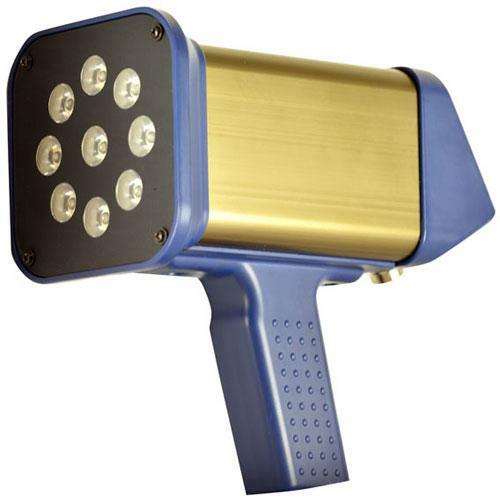 The ST-320BLs LED array provides a bright, stable strobe light over a wide measurement range with a lifetime far exceeding xenon lit stroboscopes. The unit can work off user adjusted flash frequency or from a remote sensors signal which will automatically adjust to corresponding process fluctuations. The Shimpo ST320-HANDLE is a top handle for the ST-320BL black-light Stroboscope. It allows for ease of transportation and grip.